Happy Thanksgiving from everyone here in Christmas, Colorado! As promised, I have my great-nephew Gage McBride and his wife Madison visiting with me today in Santa’s Village. You’re both looking very festive in your costumes. Madison: An elf costume that looks suspiciously familiar. Is this the one I wore in the first Parade of Lights? Gage: Yeah, it is. And you look just as gorgeous as you did that night. Madison: Thanks, honey, so do you. Gage: If you’re into guys wearing fake white beards and twenty pounds of padding. Madison: I’m into you no matter what you wear, but I wouldn’t mind seeing you in your sheriff’s uniform again, for old time’s sake. Gage: I could be persuaded . . . But what’s up with the costumes, Aunt Nell? I thought you were interviewing us about the Hallmark movie. Well, with Welcome to Christmas coming out and all, I thought it would be nice to recreate the moment you two fell in love. Remember, Madison nearly killed Santa after the parade, and you had to take his place at the town hall. Gage: Yeah, I’m not likely to forget that night, especially the time we spent in the closet. Madison: You don’t think they’ll put that in the movie, do you? Okay, see you kids later. Madison: Wait, Nell, where are you going? Calder and I are so busy this time of year, we thought with you two reprising your roles as Santa and his little helper, we’d sneak away for a few hours. See you at 5. Go right in, kids. Santa and his little helper are waiting for you. Just ignore them yelling at me. They’ll be fine once they have their milk and cookies. 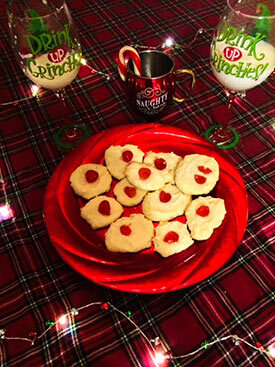 Seriously, my whipped shortbread is so good, it would put the Grinch in the holiday spirit. I should know, it worked on Madison. I’ll post the recipe under Fun Stuff on the website next week, and you can see for yourself. Maybe whip yourself up a batch to watch Welcome to Christmas on Sunday, December 9 at 8 p.m. That’s what we’ll be doing. Now I’m off for some date-day fun. I’ll be back next month to share your favorite Christmas couples’ holiday traditions.